"Die Qualität ist konstant hoch und Elastik macht es einfach, aus dem umfangreichen Content das Maximum herauszuholen. Was Loop-basierte Libraries angeht, ist dies erstklassiges Material (....)." Whether it's through Blade Runner 2049 or the incredibly successful Stranger Things TV series, those keeping an eye (er, ear?) on happenings in the world of music-to-picture composition can't have failed to notice the recent popularity of the synth-based soundtrack. This, of course, harks back to the music used in films such as Terminator, Escape From New York and the original Blade Runner. 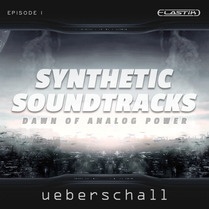 And if you are a budding or busy composer looking for some sonic inspiration in this style, then Ueberschall's Synthetic Soundtracks titles may well be of interest. There are three volumes in the series (Ueberschall refer to them as 'episodes' and the tag lines for each title make an obvious nod to Star Wars), all using their powerful Elastik plug-in front-end that provides sophisticated pitch- and tempo-matching as well a whole range of other useful sample manipulation tools. Each of the three titles is built around a construction kit format. There are 10 kits in each volume, but each kit is, itself, very extensive, with multiple musical sections and lots of loop variations. Across the three titles, some 20GB of loop/sample data is provided. Given the musical genre, as expected, synth sounds do dominate. Indeed, there are lots of very impressive and very analogue-sounding synth loops/samples providing leads, pads, arpeggios, basses and string-style sounds. Processed and dry versions are provided for many of the loops. In addition, both electronic and acoustic drum sounds are included in each construction kit as well as a more modest selection of impacts, riser loops, effects and vocals. Given the epic nature of some of the films mentioned above, it's perhaps also no surprise that Ueberschall have aimed 'big' in terms of the musical content of the various construction kits. Yes, there are a few more gentle moments and you can thin out the sample layers for a lighter sound but, in the main, this is heavy-weight, dramatic stuff. If you think of epic space battles, unstoppable alien armies and dark, dystopian, post-apocalyptic, urban landscapes... well, you will get the musical picture. And the sounds themselves are more than a match for the scale of the musical ambition. Of the three titles, my favourite content was perhaps in volume 3 (the darkest of the musical moods and perhaps with greater emphasis on some epic rhythmic elements) but, for busy media composers looking for an instant slice of synth-based soundtrack, all three volumes have plenty to offer. The quality is consistently high and Elastik makes it easy to get the maximum mileage out of the considerable content. As loop-based libraries go, this is top-notch stuff, and although the price for all three episodes may put it beyond some, you might be able to catch them in one of Ueberschall's sale events.